What I'm Reading: All the Light We Cannot See by Anthony Doerr | Oh Sarah O ! 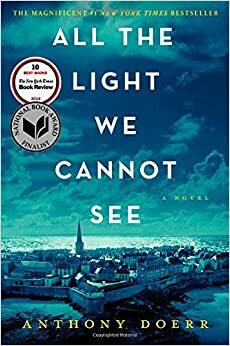 The last book that the A Beautiful Mess Book Club selected to read (in March) before taking a brief hiatus was All the Light We Cannot See by Anthony Doerr. I haven't read a lot of historical fiction, so this was a book I probably would not have chosen to read on my own but I'm glad I did. The author's writing style is very poetic and the chapters are short so it was easy to fly through the book. It was no wonder that this book is a Pulitzer Prize winner! The book takes place during WWII and primarily follows the story of two characters, Marie-Laure and Werner. Marie-Laure is a blind girl from Paris who lives with her father near the museum of Natural History before the Nazi occupation. And Werner is an orphan who lives in a German mining town orphanage with his sister and has a talent for building and creating radios. Throughout the story we discover how their lives are effected and forever changed by the war. I thoroughly enjoyed this book! It was such a page turner! Even though it's a BIG book, I enjoyed the author's poetic writing style and flew through the chapters in less than a month. I read the book so quickly, that the time flipping back and forth didn't bother me. My favorite character was Marie Laure. I loved how spunky and bright Marie Laure was and how she carefully observed the world around her through feel and touch. I liked that she was a female character interested in science and biology. And I loved how brave she was hiding in the attic, picking up messages at the bakery for Madame Manec and broadcasting messages with the radio when her uncle was unable. I think that one of the overall themes in this book is that doing nothing is as good as troublemaking- or that if you're not voicing yourself against the violence than your are for it. I think that there have been times in our global history where that has been easier said than done- like during WWII when being caught voicing your opinion against the Nazi's meant certain death, but that also made those who did voice their opinions more brave by doing so. I think that Marie Laure being blind helped the reader to gain a broader and more detailed perspective of the world around Marie Laure, Paris, the museum, and Saint-Malo, as she described the number of drains she passed by, the sounds and feel of the creatures in the sea. I find it difficult to believe in curses and things of that nature, but the book does lead the reader to believe that Marie Laure and her family were cursed by the stone. I believe that if Werner had the stone in the end, he might have been saved but his sister and orphanage caregiver might have been lost. Kind of. As I was reading I had thought (and hoped) that Marie Laure and Werner might end up together in some way. When it became apparent that that would not happen I began to hope that Jutte and Marie Laure's conversation might inspire a friendship or rekindle some unrequited love from Marie Laure towards Werner, but in hind-site I realize that the characters barely knew each other. I initially read the title literally as pertaining to Marie Laure and her blindness and later referring to the good inside each of us. I didn't catch the radio reference as quickly.